Hybrid supercapacitors; 3-D scanners for everyone; aluminum battery advancement. 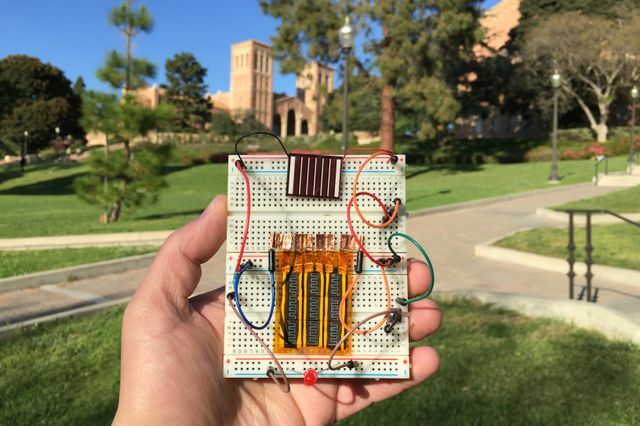 Researchers at UCLA combined the best qualities of batteries and supercapacitors in a new 3-D hybrid supercapacitor. Based on laser-scribed graphene and manganese dioxide, the new component stores large amounts of energy, recharges quickly and can last for more than 10,000 recharge cycles. The team also created a microsupercapacitor small enough to fit in wearable or implantable devices. Just one-fifth the thickness of a sheet of paper, it is capable of holding more than twice as much charge as a typical thin-film lithium battery. As a bonus, they can be fabricated without the need for extreme temperatures or expensive “dry rooms” currently required for supercapacitors. A Caltech team’s development could bring cheap, compact 3-D imaging to consumer applications. The device, a nanophotonic coherent imager (NCI), used a silicon chip less than a millimeter square to provide the highest depth-measurement accuracy of any such nanophotonic 3-D imaging device. The new chip utilizes an established detection and ranging technology called LIDAR, in which a target object is illuminated with scanning laser beams. The light that reflects off of the object is then analyzed based on the wavelength of the laser light used, and the LIDAR can gather information about the object’s size and its distance from the laser to create an image of its surroundings. “By having an array of tiny LIDARs on our coherent imager, we can simultaneously image different parts of an object or a scene without the need for any mechanical movements within the imager,” said Ali Hajimiri, professor of electrical engineering at Caltech. The first proof of concept of the NCI has only 16 coherent pixels over an active area of 300 microns by 300 microns. However, the researchers also developed a method for imaging larger objects by first imaging a four-pixel-by-four-pixel section, then moving the object in four-pixel increments to image the next section. With this method, the team used the device to scan and create a 3-D image of the “hills and valleys” on the front face of a U.S. penny—with micron-level resolution—from half a meter away. In the future, according to Hajimiri, the current array of 16 pixels could also be easily scaled up to hundreds of thousands. By creating such vast arrays of these tiny LIDARs, the imager could be applied to a broad range of applications from very precise 3-D scanning and printing to helping driverless cars avoid collisions to improving motion sensitivity in superfine human machine interfaces. Aluminum has long been an attractive material for batteries, mainly because of its low cost, low flammability and high-charge storage capacity. But finding materials capable of producing sufficient voltage after repeated cycles of charging and discharging has been a key challenge of developing a commercially viable aluminum-ion battery. An aluminum anode and graphite cathode along with an ionic liquid electrolyte was the winning combination for a Stanford University team, who created the first high-performance aluminum-ion battery that’s fast-charging, long-lasting and inexpensive. The researchers reported “unprecedented charging times” of down to one minute with the aluminum prototype, which was also able to withstand more than 7,500 cycles without any loss of capacity. But more improvements will be needed to match the voltage of lithium-ion batteries.